With a full round of Championship games live on Sky Sports this week, there’s a special guest joining the team in the studio. Few know Nottingham Forest’s squad better than Aitor Karanka, manager at the City Ground until January, who will give his insight and analysis as they head to West Bromwich Albion on Tuesday night, live on Sky Sports Football and Sky Sports Main Event from 7.30pm. Birmingham vs Bolton, Bristol City vs QPR, Hull vs Rotherham and Millwall vs Sheffield Wednesday, which all kick-off at 7.45pm, will be available on the red button shortly before they begin. On Wednesday, Dean Smith returns to his old stomping ground when Brentford host Aston Villa at 7.45pm, with coverage live on Sky Sports Football from 7pm and Sky Sports Main Event from 7.30pm. 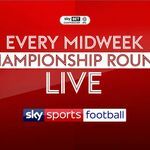 The rest of the Championship fixtures will also be available via the red button, with Ipswich vs Derby, Leeds vs Swansea, Preston vs Norwich, Sheffield United vs Middlesbrough, Wigan vs Stoke and Reading vs Blackburn (8pm) all available.